Happy Friday! Do you have weekend plans? I'm hoping to do my work quickly then do nothing but be with my family, and hopefully, just maybe, squeeze in a scrap page too. Fingers crossed. For now though I have a layout to share of my lil bub at just 6 months old. I used to take a photo everytime she wore a new outfit, this is just one I particularly like. 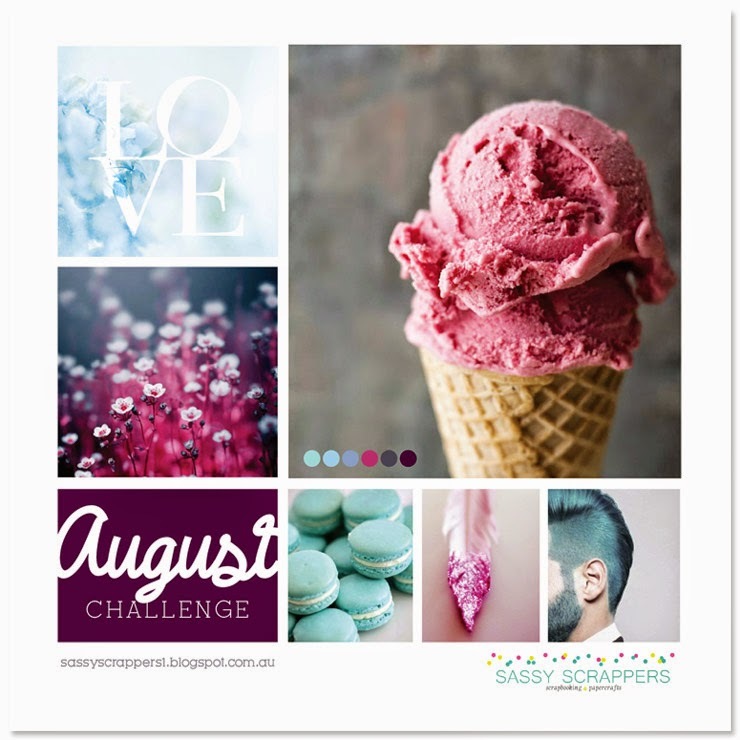 This page was inspired by the beautiful August mood board at Sassy Scrappers. I fell hard for this board as soon as I saw it! The colours and images are amazing! I took a little bit of inspiration from each image. First off I accidentally mistook the left middle picture for a bokeh pattern, (I actually only just realised it is flowers, woops) which reminded me of the background paper Bokeh Blur from Echo Parks 'Capture Life' collection. I stayed with this collection for almost the entire page. Unlike my normal process, I did not have a title in mind for the page when I began however the top left picture made my choice easy. I covered a Words Or Whatever (WOW) LOVE title piece with white Gesso and used the Capture Life Alpha Stickers. The middle bottom picture caused me to dig deep into my stash to find these feathers from Bella Blvd, I did try to create a 'dipped' look with a hot pink feather but it did not end pretty so instead just used the two different colours alternating with the title. To adhere them I stapled the steams to the page and covered it up with the 'life is beautiful' sticker. Why not come back again another day! ?